Biventricular pacemakers are a special type of pacemaker used in heart failure. The pacemaker has all the functions of a normal bradycardia pacemaker, but has an additional lead. A standard bradycardia pacemaker often has two leads, one placed in the right atrium (upper chamber) and one in the right ventricle (lower chamber), although some pacemakers have a single lead. A biventricular pacemaker has an extra lead that stimulates the left ventricle as well. Standard pacemaker leads are advanced through veins to the right side of the heart. This is because they work perfectly well from the right heart and the veins offer a low pressure route to the heart, with lower risks of bleeding. The additional lead in a biventricular pacemaker, is placed in a cardiac vein, called the coronary sinus that sits adjacent to the left ventricle. This vein can be accessed once more from the right side of the heart through low pressure veins. This is preferable to a lead placed directly in the left side of the heart, where the pressures are higher. When we use the term heart failure in the context of a biventricular pacemaker, your doctor will be referring to a failure of the left ventricle to contract normally and pump blood adequately to the body and brain. Not all patients whose left ventricle is failing benefit from implantation of a biventricular pacemaker and in certain groups, this type of pacemaker may worsen symptoms of breathlessness. Identifying accurately those patients that will benefit is very important. Why do you need an additional lead? Some patients with left ventricular failure have loss of co-ordination between the right and left side of the heart. This in medical terminology is known as ventricular dys-synchrony. The chambers are literally out of sync and for some of the time, they are working against each other, making the heart less efficient. One way to think about this, is to consider a pair of rowers in a boat. Both need to pull on the oars together. If one is out of time with the other then they are both working hard but the boat does not move as fast. The left ventricular lead when combined with the right ventricular lead, allows the pacemaker to stimulate both ventricles at the same time so that they are in sync. Moving back to the previous analogy, the pacemaker acts as a cox, encouraging the ventricles to work as a team. 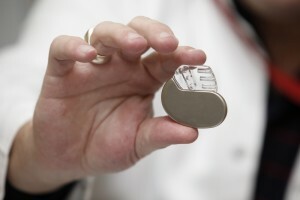 How will my doctor know if a biventricular pacemaker will be of benefit in my case? A number of different assessments can assist your doctor, in assessing whether you may benefit. The most important factors are the level of symptoms you experience, notably shortness of breath, how significantly impaired the left ventricle is at pumping and also whether the heart is out of sync. Biventricular pacemakers are of proven benefit in patients with significant symptoms, who have severe left ventricular dysfunction and marked dysynchrony. Your doctor will therefore take a clear history from you, but will also need an imaging test such as an echocardiogram to assess the pump function. Whilst the synchrony of the chambers can be assessed by imaging tests, the electrocardiogram (heart tracing) is actually the most useful test for determining whether the chambers are synchronised. The procedure from the patients perspective is very similar to that of a bradycardia pacemaker, but does take a little longer as the cardiologist needs to place an additional lead. Your cardiologist will be able to discuss this in more detail with you.